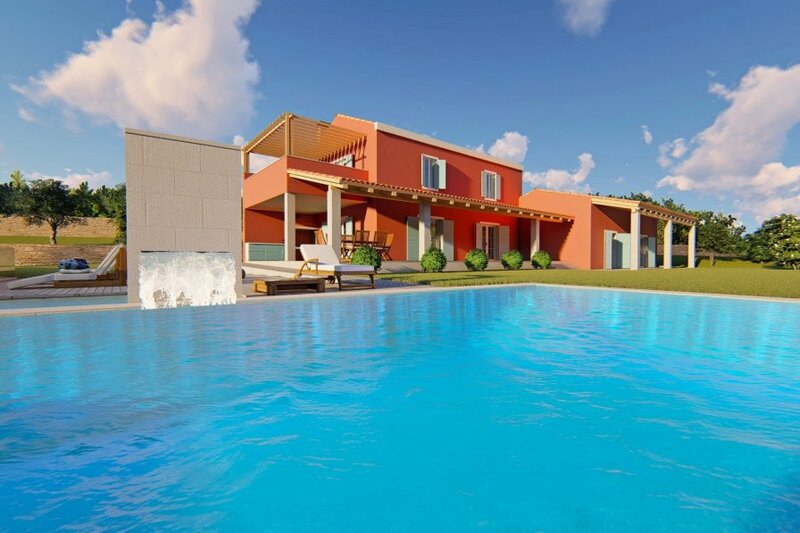 This 4-bedroom villa for up to 10 guests is located in Oprtalj and has a private swimming pool. Luxurious villa Cali, 2 storeys, built in 2019. 2.5 km from the centre of Oprtalj, 10 km from the centre of Motovun, 20 km from the centre of Buzet, in a quiet, sunny, elevated position, 30 km from the sea. Private: property 1'500 m2, garden with lawn and trees, swimming pool angular (10 x 7 m, depth 150 cm, 01.05.-28.09.). Outdoor shower, garden furniture, barbecue. In the house: internet access, air conditioning, washing machine. Available: bicycles (4). Cook on request (extra). Breakfast on request (extra). Airport transfer (extra). Parking (for 3 cars) at the house on the premises. Shop 2.5 km, supermarket 25 km, restaurant 2.5 km, pebble beach 30 km, public bathing area 30 km, concrete beach 30 km. Riding stable 30 km, walking paths from the house 100 m, cycle lane 150 m. Nearby attractions: Aquapark 27 km. Swimming pool with hydromassage. Outdoor kitchen. Massage (extra) on request. The owner can arrange excursions (on request, extra). Possibility of daily excursions by motor boat (on request, extra). 5-room villa 240 m2 on 2 levels. Comfortable furnishings: living/dining room 60 m2 with 1 double sofabed (160 cm, length 200 cm), satellite TV (flat screen), hi-fi system. Exit to the garden, to the terrace. 2 rooms, each room with 2 beds (100 cm, length 210 cm), shower/WC and satellite TV (flat screen). Exit to the garden, to the terrace. Open kitchen (oven, dishwasher, 4 ceramic glass hob hotplates, microwave, freezer, electric coffee machine). Sep. WC. Upper floor: 1 room with 1 french bed (200 cm, length 210 cm), bath/shower/WC and satellite TV (flat screen). Exit to the terrace. 1 room with 1 french bed (200 cm, length 210 cm), shower/WC and satellite TV (flat screen). Exit to the terrace. Floor heating, forced-air heating. Terrace 37 m2, 2 terraces 16 m2. Terrace furniture, deck chairs. Panoramic view of the countryside. Facilities: safe, children's high chair, baby cot, hair dryer. Internet (WiFi, free). Please note: non-smoking house. 1 pet/ dog allowed. Terrace (47 m2, roofed).